Photo of Katie Boland at the 2013 announcement of the Canadian Screen Awards nominees © 2013 by Ralph Lucas. Katie Boland pictured above at the 2013 Canadian Screen Awards. Born Katherine Lenora Boland, Katie is the daughter of photographer-director, Gail Harvey. Growing up surrounded by the film industry, she knew at an early age that she wanted to be an actor. When she was just eight years old her mother finally relented and helped her daughter find an agent. Her first small role was in the CBS mini-series The Third Twin. She first worked with her mother in the 1999 film, Striking Poses, which starred Shannon Doherty. Boland won a 2004 Young Artist Award for Best Performance in a TV Movie, Mini-series, or Special, for her role in Salem Witch Trials. 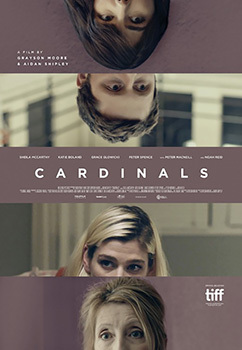 The 2017 feature Cardinal should not be confused with the mini-series also titled Cardinal.